This is an image of Saturn's giant moon Titan as seen by NASA's Cassini spacecraft. Titan is Saturn's largest moon and the second largest moon in the Solar System. It is actually 50% larger than Earth's moon. 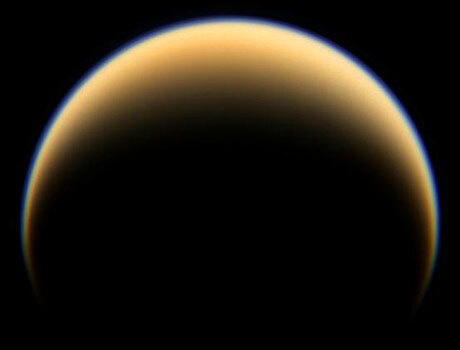 Titan is the only moon in the Solar System with a thick atmosphere. The distinctive yellow-orange color is caused by hydrocarbons such as methane and ethane. The composition of this atmosphere resembles thick smog found on Earth. Because of the thick atmosphere, Titan is believed to have weather patterns similar to those on Earth, with rain made of methane instead of water.